Microsoft’s Office 365 empowers individuals, teams and entire organizations to communicate and collaborate. Office 365 for Education builds on this foundation and adds education-specific innovations like the OneNote Class Notebook and Learning Tools—creating the most complete, intelligent and secure service for teaching and learning. It offers the broadest and deepest toolkit for content creation, personalized learning and modern classroom collaboration. And best of all, Office 365 for Education is free for students and teachers! 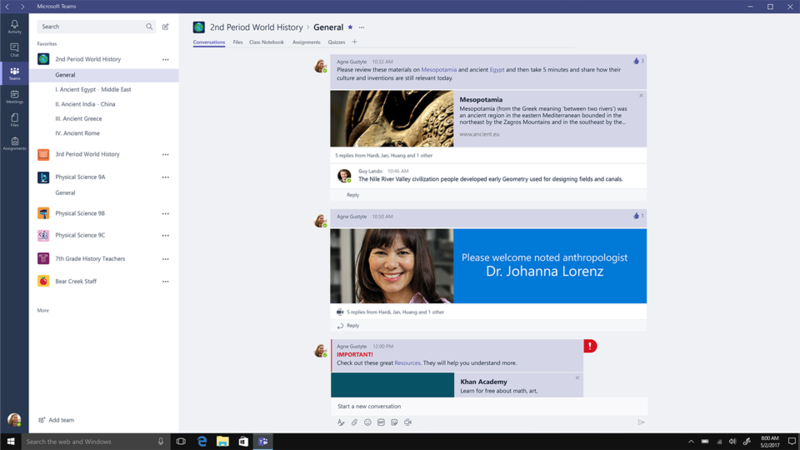 In March 2017 Microsoft released Microsoft Teams, a chat-based workspace, as the newest addition to Office 365. 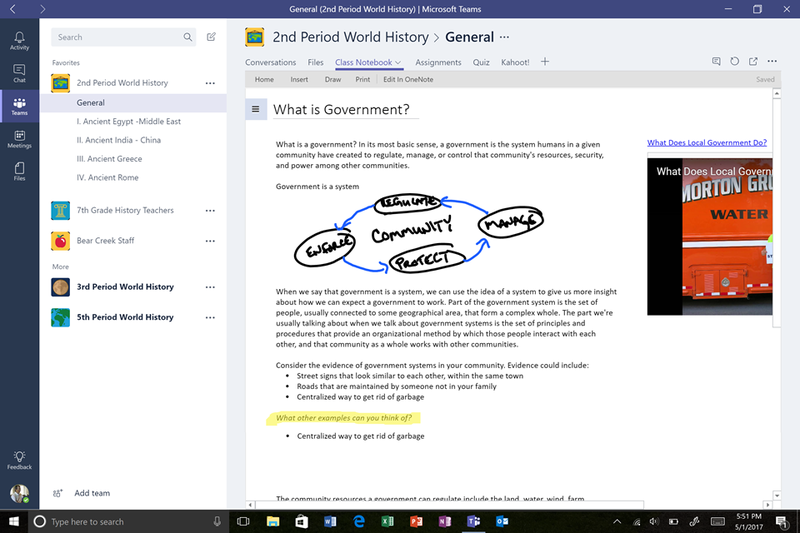 They have introduced new classroom experiences in Teams—new features that make Teams in Office 365 for Education a digital hub for teachers and students. The new classroom experiences will also help prepare students for the future. These new features do more than just simplify routine tasks. They also help students develop the communication and collaboration skills they’ll need to be successful in the future. Word, Excel and PowerPoint Online already allow students to co-author documents in real time. But the rich, persistent conversation experience in Teams takes classroom collaboration to a whole new level. This running class discussion allows everyone to read, contribute and learn at their own pace—in class or at home. And moderation controls allow a teacher to easily delete a message, mute a student or pause the conversation. Teams conversations can include just about anything students need to work together, including Word, Excel and PowerPoint documents; OneNote notebooks; and Planner for group projects. And with just one click, the text-based discussion springs to life with voice and video—making it the ultimate collaboration experience. Teams gets even better with partners, and new integrations from education tech leaders busuu, Canvas, Flipgrid and Kahoot!. From directly within Teams, teachers can now help students learn a language with the busuu quizbot; access all their information and tools in Canvas; add video discussions with Flipgrid; and easily create and share Kahoot! learning games. We live in exciting times, and the pace of change can be breath-taking. With Microsoft’s new investments in education, they’re empowering the students of today to create the world of tomorrow. The new classroom experiences in Teams will not only help teachers manage their daily workflow more easily than ever before, they’ll also help students develop the communication and collaboration skills they’ll need to be successful in the future. And Windows 10 S will open a new world of possibilities in education. Combined with the power of Teams, OneNote and the full-featured Word, Excel and PowerPoint apps delivered from the Store, this new Windows experience will offer an affordable and easy-to-manage learning platform—inspired by teachers and students and streamlined for performance and simplicity. This entry was posted in Microsoft Office, News, Training. Bookmark the permalink.